Vancouver is the Canadian Pacific Northwest’s most attractive and desirable vacation and business destination. Book your condo vacation rental through us to stay at Vacation Internationale’s Rosedale on Robson Vancouver, and see why this holiday rental is the perfect place to stay and enjoy the best of downtown Vancouver, British Columbia. These Vacation Internationale (VI) timeshare condos occupy the same building as, and share guest check-in and amenities with, the Rosedale on Robson Suite Hotel. The VI holiday rentals boast a truly outstanding location at Hamilton and Robson Streets. The best of Vancouver is all around you, with easy access to arenas, shopping, museums, and theatre entertainment. After your busy day (or evening), come back to your comfortable lodging accommodations at the VI at Rosedale on Robson. VI at Rosedale on Robson condo vacation rentals provide the ideal venue and base for football and hockey sports fans, because your accommodations are just two blocks from BC Place Stadium, home of the BC Lions, and just three blocks from Rogers Arena, home of the Vancouver Canucks. Contact us first to see if we can assist you in finding a weekly rental at this resort hotel. If we are unable to assist you, we recommend calling the unaffiliated Rosedale on Robson Suite Hotel at 604-689-8033 or 800-661-8870. When you call the Rosedale on Robson Suite Hotel, be sure to ask about their shadow inventory room rates as low as $49 per night and $299 per week. You may need to keep calling until you get a clerk who will honor these preferred customer rates, but persistence has its rewards! Other than the daily parking fees (varies with lot chosen, but $15 to $20), the prices shown are the TOTAL prices. There are no other additional charges (such as sales or lodging taxes, deposits, booking fees, etc.). The price you see is the price you pay! In the heart of downtown Vancouver, VI at Rosedale on Robson condo vacation rentals offer views of western Canada’s most exciting city. With restaurants, theaters, clubs, casinos, shopping, historic Yaletown, Gastown and Chinatown, as well as BC Place and Rogers Arena nearby, you will be glad you chose this conveniently located urban setting for your business trip, convention, meeting, conference, or vacation. Theatre goers endorse the VI at Rosedale on Robson Vancouver location for its short walk to the Queen Elizabeth Theatre and the Vancouver Centre for the Performing Arts. A little further afield find Yaletown, Gastown, Granville Entertainment District, Chinatown, and the stunning new Vancouver Convention Centre. Consider us when attending a conference here — the hotel often hosts meetings and our rates are fabulous! Disclaimers: Our usage of the names “Rosedale” and “Rosedale on Robson Suite Hotel” is legal and permissible as “fair use” or “nominative use” or “acceptable use”. It is necessary for us to use these terms because they are descriptive of a place or a landmark, and our condo vacation rentals could not be adequately described, geographically identified, or located without using the names. Our usage of the names does not imply any sponsorship, endorsement, or other affiliative relationship between us and the Rosedale on Robson Suite Hotel. The VI at Rosedale on Robson condo vacation rentals are located in the same building as the Rosedale on Robson Suite Hotel but are not part of the hotel. The VI at Rosedale on Robson lodging accommodations are not furnished or maintained by the Rosedale on Robson Suite Hotel. 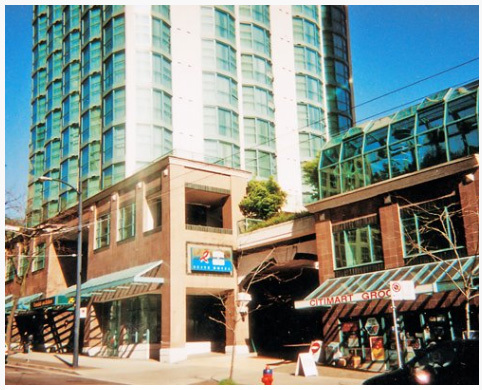 The only connection between the Rosedale on Robson Suite Hotel and the VI holiday rentals is that they share the same building. Renters of the VI units are not considered to be guests of the Rosedale on Robson Suite Hotel. VI contracts with the Rosedale on Robson Suite Hotel to perform check-in duties. For any questions regarding housekeeping and maintenance, please contact the VI Manager at (604) 685-2115 during business hours.